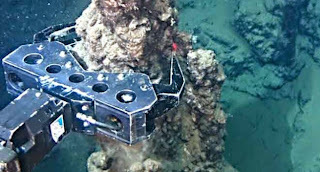 NAUTILUS Minerals remains committed to the Solwara-1 project near New Ireland, the company says. PNG country manager Mel Togolo said Nautilus had achieved various milestones in developing the deep-sea mining project. He said one of the highlights was the progress on the building of the production support vessel which would be completed at the end of 2017 and the testing of three seafloor production tools. r the supply and installation of various key components to the production support vessel. “The sea floor production tools are undergoing commissioning currently in England and their delivery is expected at the end of the year, so that’s a big hurdle for us,” Togolo said. He added that he was pleased with the progress of its corporate social responsibility programmes that were currently underway to deliver much needed services to communities in New Ireland. “I am happy to say, our water and sanitation pilot programme from last year continues into 2015 with the second phase recently kick started,” Togolo said.